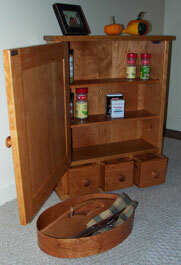 The overall dimensions of our kitchen spice cabinet are 20w x 6½ x 26h. It comes in your choice of solid cherry or oak with a hand rubbed finish, in poplar with 56 colors to choose from, or unfinished. 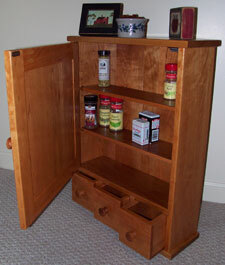 Our kitchen spice cabinet can be ordered with or without three apothecary styled drawers. 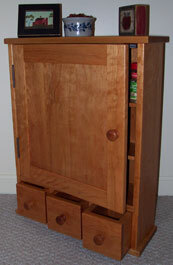 With the drawers, it comes with two adjustable shelves; without the drawers, it comes with three adjustable shelves. 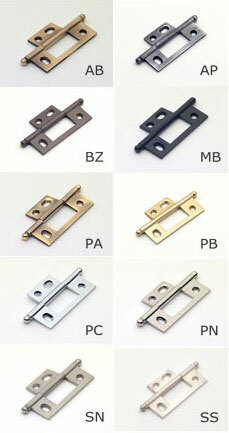 You also have your choice of a left or right hand door and several hinge and knob finishes to choose from. NOTE: Prices shown below are full price. However, only 50% is due at time of order with the balance due when your item is ready to ship. Due to it's size add $15 to regular shipping. If you chose a painted finish above, choose your paint color below, otherwise scroll down to "which way the door should open".